ARTHROFIX® AIR stabilises the ankle joint and prevents lateral and medial twisting of the foot. The ankle joint is stabilised by the two anatomically-formed side-panels with Velcro-fastened air cushions. 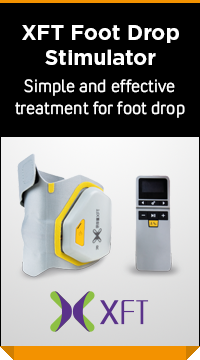 When the orthopaedic brace is in use, the air in the dualcell air cushions is distributed such that a shape, formfitted to the ankle joint, with optimal stabilisation and a high level of wearing comfort, is achieved. The stabilising effect of the orthopaedic brace is optimised by being worn in a closed shoe. - 2 Thread the lower and upper Velcro band through the guide-loops. Adjust the foot-pad to the width of your ankle using both Velcro fastening points. Fasten the foot-pad onto the side panels. Now, adjust the orthopaedic brace on the lower leg such that the hollows in the anatomically-formed side panels are located with the air cushions over the medial or lateral ankle. Hold the brace in this position. - 3 Fasten the lower Velcro fastener first. When you attach the Velcro strap, ensure that the side panels do not move from the position set in Step 2.
and form-fitted shape is achieved over the medial or lateral ankle. Wear the orthopaedic brace over a stocking or sock. We recommend washing the ARTHROFIX® AIR air cushion gently in lukewarm water with a mild detergent and airdrying.